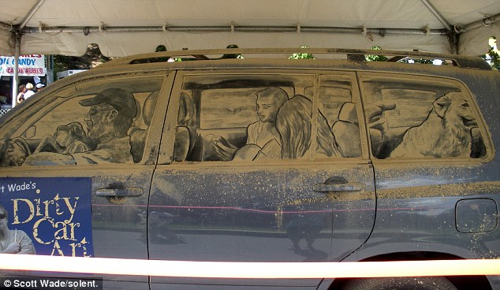 Scott Wade has become known as the “Dirty Car Artist” (with a few others added as time moved on) from the art he creates using dirty car windows and his talent. We contacted Scott and asked him a few questions about his amazing work and where it all started. 1.Tell us about yourself, how your passion started and where you’re now? 2.Whats your favorite creation from your whole collection? 3.What needs to happen in your morning routine in order to ensure maximum creativity? 4.What was your biggest live performance and what did you sketch? 5.What tool do you use the most and what is the most unique object you use in your art? 6.Ever been busy with a masterpiece and it started to rain? 7.Favorite nickname you’ve been dubbed with? 8.Besides dirty car art what else do you do? 9. Any advice for artists who are searching their own style? Living at the end of a mile and a half of dirt road in Central Texas for over 20 years gives one a a sense of inevitability when it comes to one’s car- it’s just going to be dirty, period. No point in washing the thing, and living on a small and precious aquifer, the idea of using that beautiful, pure water to wash a car just feels wrong. Back at the house after a day at the office, I’d often be drawn (pun intended) to that dust-covered rear window, using my finger to sketch comical faces, a pastime I acquired from my dad, who was a great amateur cartoonist. After hundreds of these quick drawings, I wanted to see shading, and would use the pads of my fingers brushed lightly to add a rude “gray scale.” I found my fingernails could make a finer line. One day while playing on some dirty glass, I pulled a popsicle stick out of my mouth I’d been chewing on, and used the brush-like end to see what sort of texture it would make. If there was an “ah ha” moment in this journey, that was probably it. I grabbed some brushes from my studio, and was soon discovering that a dirty car window can be a medium for some pretty intricate drawings. I loved the feel of it, and started challenging myself with reproducing some famous paintings. As photos were emailed around, I was asked to be interviewed by a local paper, and soon my work was going viral. I started getting requests to demonstrate at events, on television and in magazines, newspapers and blogs all over the world. My favorite piece? The next one! Completely stole that from Frank Lloyd Wright. But I do feel that way. I like some of those early reproductions, like Botticelli’s ‘Birth of Venus” and the storefront pieces I did in Vancouver and Austin were really fun because of the scale. Much of my early work was less technical or well thought out, so in some ways I prefer my later pieces because I feel like I’m understanding the medium better, and my compositions are generally better. I don’t know about biggest. Certainly one of the most exciting was at a mall in Istanbul over a couple days. That probably wan’t the biggest crowd. That may have been a corporate gig at a World of Outlaws dirt track racing event. I will say so far my favorite car to work on is the Ford Flex, which I’ve done at a few events- all that nice, rectangular glass at a comfortable working height! I’m doing an event later this month on MINI Coopers. I love working on those; I had a MINI when I started doing this. I once created 4 pieces on a bio-deisel-powered Hummer. Had to use a ladder to reach the windows- turned out pretty cool, though! Probably the one tool I couldn’t do without is a fan brush. I have several, but mostly use a medium-sized one and a small one. I use a rubber paint-shapping tool with a chisel tip for lines. Maybe the most unique is a stick I whittled to a fine point that I use for sketching proportions. Sometimes if I don’t have my tools with me and a dirty car presents itself, I’ll pick up something laying around and give it a try. I once did a drawing using a wildflower as my brush. I don’t know about masterpiece, but yeah, several times. Once I was being filmed and kept working and changing the piece as big drops would land. I love the ephemeral nature of my medium. It’s happened a few times that media have been filming me creating a piece and then right when it’s finished, it starts to rain. I just love it. The first one was by the National Inquirer, “The Divinci of Dust.” That’s flattering and all, but I prefer the Dirty Car Artist. El Dusterino isn’t bad, either (unfortunately, no one’s ever called me that). Well…I’m Senior GUI Designer at Airstrip Technologies in San Antonio. I’m a drummer/percussionist, playing professionally for over 30 years. 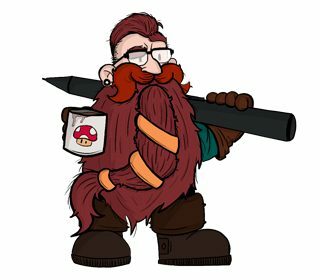 I sculpt, paint, freelance illustration and graphic design, do scenic painting for our community theatre, and always have a project going at the home I share with my wife and daughter. I pretty much love all art media and love to try new things. I just finished a 6’x4′ acrylic & oil painting for the lobby of the office where I work. I’m really lame at a lot of stuff, but I just love to create, in fact don’t really feel alive if I’m not involved in a project. To me, style is not important. What’s important is doing what feels right. And if what feels right is copying other artists to figure out what they’re doing, then just do that. It’s some kind of paradox that we don’t really find our unique expression until we totally forget ourselves and merge with creativity itself. Well, that sounds weird, but it’s right. Thank you for your time Scott, we’re pretty excited about this interview.